Just who is dangerous to know? – This book keeps you guessing. Today is my stop on the ‘Dangerous to Know’ Blog Tour. ‘Dangerous to Know’ by Australian author Anne Buist features troubled forensic psychiatrist Natalie King, who is back from a stay on the psych ward. Seeking a quieter life, she retreats to the countryside on a secondment, but Natalie and trouble have a strange mutual fascination, and she finds herself drawn deep into a mystery that puts her in danger. Like some other reviewers I hadn’t realised this was the second book in a series about forensic psychiatrist Natalie King. And while not having read the first book did not spoil my enjoyment of the second, I did find ‘Dangerous to Know’ a bit hard to follow. Something which I might have avoided if I had read the first novel in the series. There are a lot of characters in this book, some of which I now know were in the first book ‘Medusa’s Curse’ and also a lot of action to take in. The story benefits enormously from Anne Buist’s own experience of working in the field of psychiatry. It meant that the leading characters that had mental health problems, of which there were a number, were convincing and their characterisation was deepened as a result. Although sometimes I found Natalie’s analysis of their condition distracted from the narrative. But for those seeking to know more about being bipolar, postpartum depression and personality disorder this is an additional fascinating context. I liked Natalie King a lot. She’s a rebel with bipolar who recently had treatment herself for severe depression and I think there is more about the circumstance that brought this about in book one. She is sassy, intelligent and independent. Anne Buist does an excellent job of placing the reader in Natalie’s head. I could connect to her emotionally in a way I didn’t with most of the other characters. I didn’t warm to Frank the main antagonist and found his alternate first person narration irritating, but perhaps I was supposed to. At first I was convinced he was the one who was dangerous to know but as I read on I kept changing my mind about who it really was, and the reveal at the end came as a surprise. I did find the first half of the book hard to follow but it was worth the effort as the pace picked up and the plot moved in diverse directions ‘Dangerous to Know’ is an intellectually satisfying book and well worth reading if only to see if you can work out who has done what and why. Many thanks to Lucy at Legend Press for giving me the opportunity to review this novel. 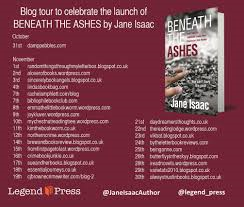 Today is my stop on the ‘Beneath the Ashes’ blog tour and I’m delighted to be able to share not only my review of the book but also a some insights into Jane Isaac’s writing in an author Q & A. When a body is discovered in a burnt-out barn in the Warwickshire countryside, DI Will Jackman is called to investigate. Nancy Faraday wakes up on the kitchen floor. The house had been broken into and her boyfriend is missing. As the case unravels, DI Jackman realises that nothing is quite as it appears and everyone, it seems, has a secret. Can he discover the truth behind the body in the fire, and track down the killer before Nancy becomes the next victim? ‘Beneath the Ashes’ opens with a prologue which sets the tone for the story to come. A woman is frantically running towards a graveyard. We have no idea who she is or what she will do next but it draws you in. We go back a week and follow the story through the voices of DI Will Jackman, a likeable well balanced police officer with a family life restricted somewhat by his disabled wife, and Nancy a young shop assistant who wakes up on her boyfriend’s kitchen floor covered in blood but with no idea of how she got there. There is a good working relationship between DI Jackman and his Sergeant Annie Davies and together they go down a series of blind alleys to try and find out the mystery behind Nancy’s attack and the murder of her boyfriend. I particularly liked Nancy. She is feisty and independent and doesn’t always do the right thing. As the three characters delve more deeply, things are not what they seem. Surprising new themes emerge as Nancy struggles to stay safe and make sense of what is happening to her. The pace quickens towards an unmissable dramatic crescendo when the truth about what has really happened to Nancy’s boyfriend starts to emerge and you are compelled to read to the end to find out why. This is the second book in the DI Will Jackman series but ‘Beneath the Ashes’ sets the scene and introduces the main characters with clarity and enough background information to create a satisfying and enjoyable read whether you are meeting DI Will Jackman for the first time or as an old friend. Who was your favourite character to write in ‘Beneath the Ashes’? I really like Jackman’s sidekick, DS Annie Davies. She’s sharp, intelligent and witty, and has the ability to find the humour in almost any situation, but balances this with bucketloads of compassion. Some of her thoughts and comments made me laugh out loud as the story progressed. ‘Beneath the Ashes’ is a whistle stop read, how long did it take you to write it? Thank you. The story had been in my head for a quite a while, so it didn’t take too long to write a detailed plan of how I expected the narrative to unfold. Once that was done, I concentrated on the first 10,000 words which really set the foundations in place. The rest of it flowed well, only broken by bouts of research, as I went along. It was about a year from recording the initial idea to actually typing ‘The End’. Who did you prefer writing, DCI Helen Lavery from your first novel or DI Jackman, and why? Ooh, that’s a toughie. I enjoy working with them both, for different reasons! How important is the setting of Stratford upon Avon to ‘Beneath the Ashes and what made you base your novel there? When I decided to embark on the Will Jackman series, I wanted to set it somewhere that people might know even if they haven’t visited themselves. Stratford upon Avon is known the world over, and also a very beautiful place to visit for research purposes (my family and I have spent many a happy weekend there during the past two years), so it ticked all the boxes! Whose novels do you read and do you read while you’re working on a novel? As I’m constantly planning, writing or researching, I do read throughout the process. I tend to read a lot of different novels, mostly crime and psychological thrillers, but I also like travel memoirs too. Most recently, I’ve been discovering a lot of new writers. There’s something special about debuts that draws me to them. The last book I read was Rubicon by Ian Patrick, a finely crafted debut which is now out for submission and I have everything crossed for him for a book deal. That book really deserves to be published! How much do you plan your narrative in advance? I write a detailed outline, usually 4-5 pages, before I start. Things do change as the story unfolds, but I change my outline too so that when I finish my first draft and do my initial read through, I can check back and ensure that everything weaves together. As I still have a day job, a family and a very demanding Labrador, I tend to fit my writing into the gaps in my day. I can often be seen writing notes on my phone while standing in the supermarket queue, or typing on my laptop at the side of the pool while my daughter is swimming. I have notebooks all over the house, so if an idea comes to me I can record it before I forget! I suppose my favourite time to write is sitting up in bed with my laptop, late at night when the house is quiet. How do you get under the skin of your characters? For me, it’s essential to get to know a character, especially a lead, so that they come to life on the page. Writing through the eyes of DCI Helen Lavery in my first two novels was like second nature. While Helen is very different from me, she is a working mother who juggles her home and work life balance. I could relate to that and build her character on that basis. Creating the male lead of DI Will Jackman for my new series was much more challenging and took me back to basics. I pulled on my favourite male fictional characters and analysed their behaviour; writing down the elements I liked and that fitted with what I was trying to achieve, disregarding the ones that didn’t. I considered the male influences in my own life: my father, my brothers, my husband and my friends. I spoke to a lot of serving police officers and detectives to see what their working/home life was like. And slowly the foundations of Jackman’s character were laid. But even then, as I was writing I was constantly saying to my husband, “How would you react to … What would you say to…” for validation that I’d got him somewhere near. What was your first job and has it influenced your writing? Ironically, my first job (apart from delivering newspapers in my early teens) was as a receptionist for a small marketing newspaper. At the time, I had no inclination to become a writer and was in awe of the journalists there. I was in my forties before I discovered my own love of the pen! I’m just starting the edits for The Lies Within, the third book in the DI Will Jackman series, which is scheduled to be released on 2nd May 2017. What advice would you give to anyone wanting to become a crime author? Read voraciously in and around the genre you intend to work with and try to write something every day, no matter how short. When your script is complete, send it to people you trust to give you honest and constructive feedback, then rework until it is the best you can do before you submit. 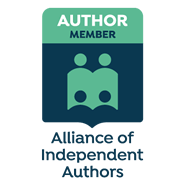 It can be difficult to find a home for a novel and publishers reject submissions for many reasons which are not necessarily anything to do with your writing: It may not fit with a publisher’s list, they may have something similar, they may not be looking for submissions in your genre at this time. So, if you receive a rejection, don’t give up; take heed of any advice, rework your script if necessary, and submit elsewhere. Thank you so much for interviewing me Chris. I really enjoyed answering your questions! On Saturday, 19th of November I will be posting a review of Jane Isaac’s latest crime novel,as part of the ‘Beneath the Ashes’ Blog Tour and asking Jane some questions about her writing. Don’t miss it!